The NJMC staff use wireless devices to collect data as they move around the District. Similarly, visitors, scientists, students and eco-tourists also move around on their own collecting scientific data, or just walk around looking at birds and taking pictures. Visitors to the District have also the possibility of taking a Commission guided tour of the Hackensack River where a guide points out the interesting aspects of the immediate landscape and wildlife. This project is building a mobile communication infrastructure to enable an auto-guided environmental tour using the Internet and hand-held devices. This application will allow visitors to move around with a hand-held devise (maybe a cell phone or PDA) and historical and current information available for that specific location is delivered to them. The information type will be adjusted according to the user’s preferences; for example, a bird watcher may only be interested in bird types, their habits and the quality of the surrounding environment. A planner on the other hand, would be more interested in the historical land use data for a particular location and would want to see historical aerial photography or historical blue-prints of planned structures. As in a museum audio-guide system, the relevant information is identified and streamed based on the person’s location, preference and expertise. Unlike the museum audio-guided tour however, the information is not restricted to audio but will also include multimedia, images/pictures, maps and textual narratives. 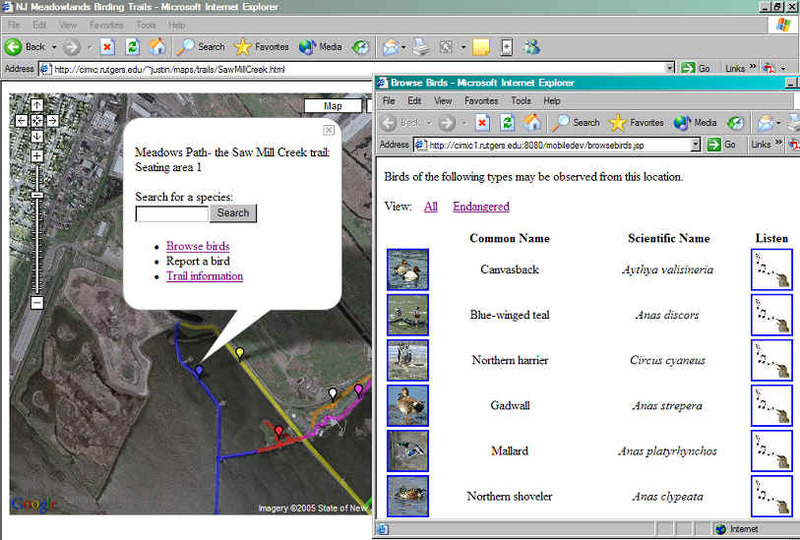 In addition, through what is called a “location-specific environmental information blogging”; users can interactively enter new data from a location into the system for the future sharing of information. The system will also support data “pull”, allowing queries by users of different levels and expertise. Researchers and engineers in the field will have background information for any location in the District they may visit. Bird-watchers and tourists may roam around freely with District wildlife information and maps readily available to them. With many users entering their blogs, more and diverse information will be available for the District. The system also supports a virtual tour: i.e., even if a person is not physically present, by entering coordinates and clicking on a certain location on a map on their workstation, he/she should be able to receive the same as if he is physically present.